14 years removed from his last Green Jacket. 11 years since his last triumph in a major. It will be a decade ago this November since that fateful “Thanksgiving Eve” occurred, sparking a tailspin none of us could have imagined possible. Just two years ago, Tiger Woods endured a risky spinal fusion surgery that could have ended his professional golf career, and a DUI arrest that could have ended whatever goodwill was left towards the embattled legend. Sunday at Augusta National, the 43-year-old left his controversies and injuries behind to reclaim the throne as Golf’s greatest player, all on its grandest stage, and the site of his breakout into superstardom 22 years before. The final round was moved up into the early morning due to weather, and rare Sunday threesomes were played in order to get everyone through before the rain came in. Having to be grouped with the greatest player of a generation, with an entire gallery pulling for him had to be taxing on recent Major Champions Francesco Molinari and Brooks Koepka, but the story of every comeback also involves the door being opened by the opposition. Foreman exhausts himself in Zaire. Ryan fumbles deep in Falcons’ territory. Molinari’s tee shot finds its way into Rae’s Creek on the treacherous 12th hole. Koepka’s first also meets the same wet fate. Tiger takes “Jack’s Shot”, a less aggressive line between its two bunkers, but away from the pin. Woods secures the par and takes an outright lead for the first time. Four players in the final two groups put it into Rae’s Creek on 12. The experience of the then four-time Masters champion shone through the impending clouds, and then “it” happened. A moment straight out of an EA Sports video game that had his name attached throughout his spectacular run, before the fall from grace. Woods tee shot on the par three 16th hole was fired directly out of a time machine. Put on a line and riding down the ridge he made famous with his chip of the decade at the 2005 Masters, it nearly holed out and was left in “gimme” range to add another stroke to his improbable lead. It put the gallery into a complete frenzy, set Twitter ablaze, and sent the Augusta tailor out to check measurements for yet another Green Jacket. It meant the last two holes would play the role of formality as the comeback was completed. In these final two holes, Woods also would add a jewel that was missing from his career crown. In his career’s 14 major championships, he had always entered the final round with the lead and held off the opposition but had never overcome a Sunday deficit to take home the title. Accused of being a “front runner”, he only faltered with a Sunday lead a single time, at the ’09 PGA Championship to an upstart Y.E. Yang. Was Tiger supposed to play from behind? Hard to do when the others had such a hard time keeping up to begin with. This can no longer hang over him now, another drought washed out like rain on Butler Cabin. Next month the golf world turns to what can be considered the site of the greatest victory during his prime. Between the 1999 PGA Championship and the 2002 U.S. Open at Bethpage Black, Woods captured seven out of thirteen majors contested. Culminating at one of the hardest courses in the world, at it’s hardest conditions for the national championship. One of only two players to finish under par, it served as a capstone to a run that will likely never be seen again. Bethpage will host the PGA championship this time around, and serve as another chance to close the gap on Jack Nicklaus and his 18 major championships. 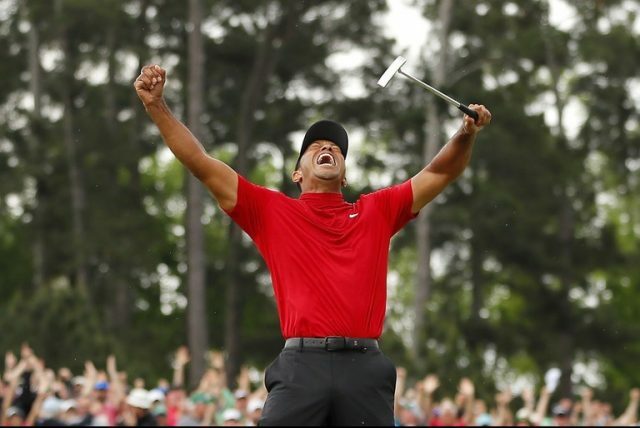 To look ahead further, 2019 is coming up all Tiger, as the U.S. Open will be held at Pebble Beach, where he won a U.S. Open by fifteen strokes, still the record for margin of victory in a major. This series of homecomings can only happen for a player who has racked up history across golf’s most famous courses. Though he is now chased by those who grew up idolizing him, the “Tiger Effect” can still be felt. Maybe it isn’t fear as much as it is respect. Judging by the way he was greeted after coming off the eighteenth green and commented on by his competition on social media after winning Sunday, the aura is alive and well. We could all feel it following his close calls at majors in ‘18, and victory at the Tour Championship, but East Lake isn’t Augusta. It’s official. Tiger is back.